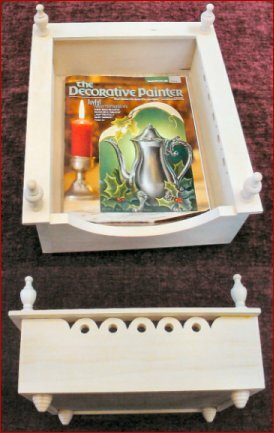 This beautiful magazine box would be a nice accent piece for your coffee table. Painting style is unlimited, but the box lends itself well to the "O's" style of rosemaling. Dimensions are 13 ½ inches x 11 ½ inches x 4 inches high. (6 ¼ inches with the finial).